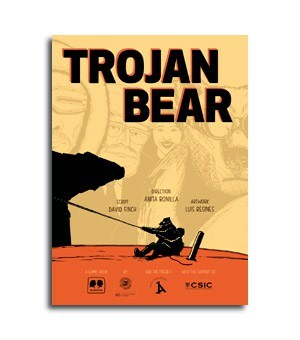 The comic book “Trojan Bear” is inspired by adventure, science, history and myth. It’s mission is making the reader travel to the Arctic through the eyes of characters that recreate the world of scientific research in an attempt to create awareness about the importance of their studies on climate change. Cassandra was a priestess of Apollo. She and the god made a deal: her unconditional love in exchange for the gift of prophecy. However, when she finally gained access to the secrets of divination, she rejected Apollo. Because of this betrayal, the god cursed her by spitting in her mouth. “Retain the gift of prophecy, but no one will ever believe in your predictions” he cursed.